FORT GAY. 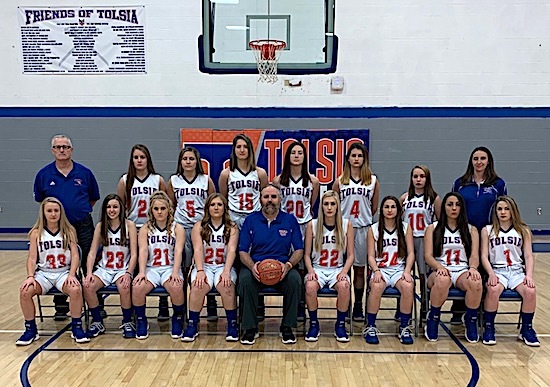 W. VA. — It was a tough season last year for the Tolsia Lady Rebels who only won 8 games on the year even though they played pretty well down the stretch for Ric Morrone who has a overall record of 391-213 at Tolsia and is going into his 26th year as Head Coach. Tolsia lost five seniors off last year’s team but return team leader and do it all player in Senior Sarah Jude who is 5-10 and can handle the point or post up and score in the paint. The Lady Rebels expect to get contributions from a bunch of youngsters including 6-0 Sophomore Julie Boone, 5-7 Sophomore Selena Browning, and a pair of 5-8 Freshman Lynndsey Cassell and Katelyn Kelly, 5-7 Junior Trinity Muncy along with Sophomores 5-5 Elizabeth Johnson, 5-10 Jace Litton, 5-9 Kylea Pollinger and 5-7 Becca Castle will provide depth. 5-6 Junior Taylor Ball is a long range shooter. Tolsia will once again play a good schedule with the always tough BJM Classic at Rebel Arena on December 7th and 8th. Home and Away with Lawrence Co. two games with Logan and tough trip to Ravenswood along with the always tough WV HIT tournament which the Lady Rebels finished third last year.